View cart “Vented Windshield for RTV 400 & 500 Quantum Coated” has been added to your cart. A metal roof that will stay with you. 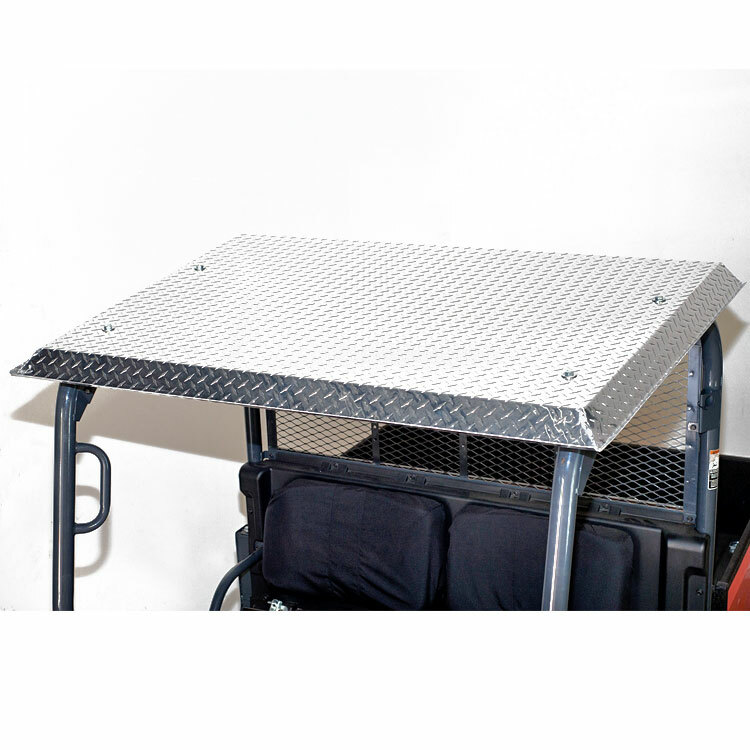 The Diamond Plate RTV Roof is a metal UTV roof. It’s a durable UTV roof that won’t crack like plastic. It’ll stand up to whatever you and Mother Nature throw at it. In fact, chances are it’ll outlast your Kubota RTV since it’s made out of aluminum. Not only does the Diamond Plate RTV Roof help keep you out of the sun by providing shade, but this UTV roof is also designed to help keep you dry on rainy days. The rain gutter on the roof adds significant weather protection over other standard UTV roofs by helping to keep rain off your lap while riding. You bought a Kubota RTV. It’s a UTV and it’s meant to take abuse. Chances are you’re going to use it like a UTV, which means you need a durable roof. So that’s why it’s a good feeling knowing that you can drive your Kubota RTV anywhere, including the thick woods, and your UTV roof won’t crack or tear off like vinyl or plastic UTV roofs do. Whether you’re hunting or just out for a ride, you don’t need your UTV roof to be part of the soundtrack. The Diamond Plate RTV Roof doesn’t shake or rattle. It’s a UTV roof that keeps quiet so you can enjoy driving your Kubota RTV and the activities that go with it. Includes a rain gutter on the roof that adds significant weather protection by helping to keep rain off your lap while riding. Ability to use it as a platform! Stand on it to get a better view, to hunt, or simply reach those hard-to-reach work areas. Is not compatible with Kubota factory glass windshield.